We know that, if we want to change our bodies, we have to overload the muscles. When we do that, the body’s response is an adaptation, which refers to your body’s physiological response to training. First Few Weeks – The first few times you do cardio or strength training, your body kind of freaks out as it gets used to this new stimulus. It’s during this period that you experience soreness and, maybe, the feeling that you’re making a big mistake. But you’re not, so don’t give up. 4-16 Weeks – That’s a big range, but experts suggest that it’s during this phase that your body adapts and becomes more efficient at the exercises and activities you’re doing. After 16 Weeks – This is where there’s a point of diminishing returns and your body stops responding to your workouts and you may hit a plateau. You’ve Hit a Plateau – If you stop losing weight or stop making progress with your strength workouts, it’s time to make a change. In fact, any time you feel stuck in a rut, you probably are. Don’t wait for it to happen, but start making changes as you go along. You’re Bored – The first sign you need to change is when your workouts are so boring, you’d almost rather do anything else. You’re Burned Out – Burnout is a little more serious and you may actually need to take a break from your regular routine and try something totally different. 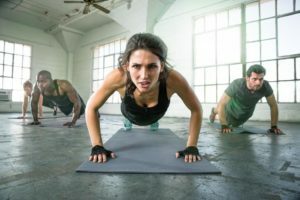 If you exercise alone, try a group fitness class or vice versa. Just about anything new will feel refreshing. You’re Constantly Injured – This may also be a sign that you’re overtraining. Doing the same thing over and over is never good for the body or mind, so this is a great time to take a bit of a longer break and maybe do other activities to heal your body, like yoga or Pilates. You Start to Hate Exercise – If it feels like a chore every time you workout, that may be a sign you need to shake things up. The important part of the exercise isn’t the type of program you have, but having one you’ll actually do. If your body, and mind, has adapted to what you’re doing, any change is a good thing. Don’t get too hung up on doing the right thing for a certain period of time. Once you get to a certain fitness level, say after training consistently for 3 or more months, you can change things up every week if you like. It might also be worth it to set up a periodization program so that you never have to worry about hitting a plateau. Whatever you do, pay attention to how you’re feeling about your workouts and make the change before you hit that plateau. It’s easy to get into a routine without realizing how long you’ve been doing it. This entry was posted in Fitness & Exercise, Motivation, Self-care, Well-being. Bookmark the permalink.